It’s a bold, new world here at Thompson. Subscribers now have a greatly enhanced method to receive our award-winning news and analysis. This month, we launched Thompson’s Federal Grants Compliance eXpert, expanding the company’s digital resource library of online products to help subscribers stay in compliance with federal rules and laws. 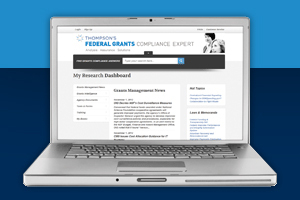 Federal Grants Compliance eXpert brings news and analysis from the Federal Grants Management Handbook and Single Audit Information Service online in a whole new way that is user-friendly with real-time updates. Stay ahead of the game with rolling updates as soon as important changes happen. Rather than waiting for monthly updates, we will be posting breaking news and developing issues right away. Read analysis and best practices from leading experts in the grants industry to stay informed on compliance. Find exactly what they need on any grants-related topics quickly with our powerful search engine. Resolve unique situations and receive answers to complex questions with easy access to subject matter experts. Locate federal and state law, regulations and statutes in one spot rather than scouring across various resources. Access education and training through specially-selected webinars. Currently, Federal Grants Compliance eXpert subscribers will have access, at no cost, to Thompson’s webinar on “OMB’s Proposal for Grant Reform: What Grant Recipients and Subrecipients Need to Know,” including handouts and related materials to help train staff and other managers in their organizations. Along with the opportunity to read stories sooner, I think the site’s search function will really be a boost, allowing subscribers to narrow their search to quickly find the answers they need. Helpful references also can be included in research folders to allow subscribers to easily store searches, refer back and find answers to issues they frequently face. In addition, offering the news and analysis digitally allows for users to easily find the information they need on their iPads or laptops when travelling. For those who are used to the traditional printed handbooks, the Federal Grants Management Handbook and Single Audit Information Service will continue to be available in print, with traditional monthly updates and newsletters. We even offer both the digital service and print to those who would prefer to order both. However, as we all move into the digital world, the grants community now has an eXpert digital resource of its own. An annual subscription includes electronic updates, news, analysis, training tools and forms at no additional charge for the 12-month subscription period. To request a 14-day free trial of the new service, contact Thompson’s client services at 800-677-3789 or email service@thompson.com. Be one of the first to request the trial of the new service and give us some feedback. We want to know the best way to serve you.